Sorry about the silence lately. It has been a busy couple of weeks and the books haven't been left untouched but they definitely didn't get enough attention. Charlaine Harris is one of my favourite authors. She has offered many a great cozy mystery and paranormal or not she always tells a great story with characters that are full of strange and interesting backgrounds. The Texas Midnight books keep to this trademark and with Night Shift bringing the trilogy to an end there are more and more unusual revelations and some intriguing twists and turns. The crossroads town is waking up and not in a good way. Finally the residents have noticed that not everyone is who they seem to be and that the new hotel isn't what it claims to be but very strangely there is a new resident that nobody seems to care about meeting. However the most bizarre thing of all is the suicides and the voice that is talking to one of the residents. If things were somewhat spooky and odd in the last two books then this third installment is even more peculiar and extraordinary. There are a lot of surprises and revelations but most of all there are some fascinating developments and depth in the stories of the town and residents of Midnight. I was hooked after a couple of chapters and found it really hard to put down. Like most of Charlene's books you can't help but get sucked completely. After listening to the first two books I actually read this one and I have to say it was just as enjoyable. The characters are likable and compelling and each has its own strange quality. Also the tie ins to her other books/series are enough to make any fan love this book and the previous ones. Vampires, werewovles, witches and a nod or mention to many other aspects of the well known books from years past. While there is always a 'I want more feeling' when a series is over I have to say that this trilogy is definitely ending too soon. Usually a series coming to and end feels right despite wanting more but I was only left thinking that Midnight or at least the residents still have more stories to tell. 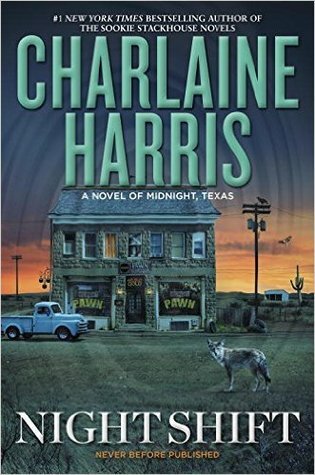 Maybe Charlene will have a change of heart and continue writing stories about this crossroads in Texas but I guess I would also be happy to see another 'spin-off' type of story where Midnight is mentioned and some of its characters show up just like in this trilogy. Whatever comes next will however be on my reading list. So far the author hasn't disappointed me and I can't wait to see what she has in store for us readers next. I am glad you enjoyed this series, but it does not tempt me. I will try one of her older cozy series one day though.